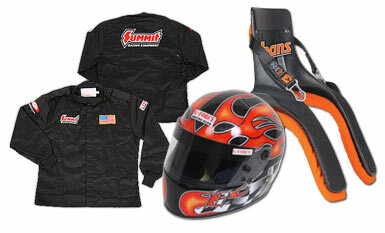 There's no need to compromise when it comes to safety because Summit Racing carries a full line of top-brand safety equipment to help you race fast, race hard, and live to race another day! Our massive inventory of circle track safety equipment includes harnesses, helmets, head and neck restraints, driving suits, gloves, shoes, fire suppression systems, and more. Race with the confidence of knowing you’ve chosen top-brand safety components—RCI Products, RJS Products, HANS Performance, Bell, Kirkey, Simpson, and more! Shop now!